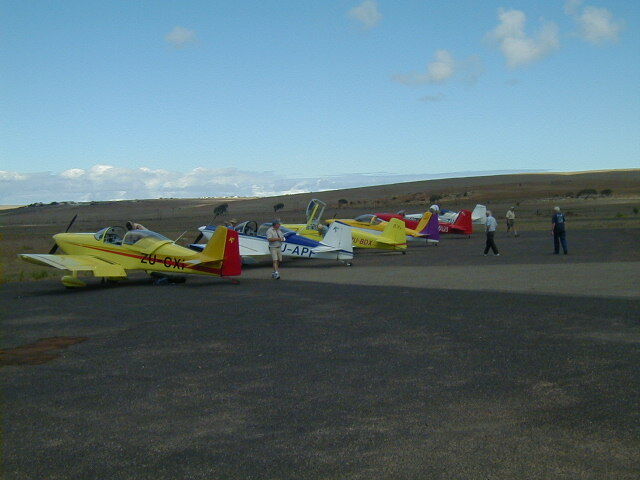 West Coast Fly-In: 16-22 March 2006. 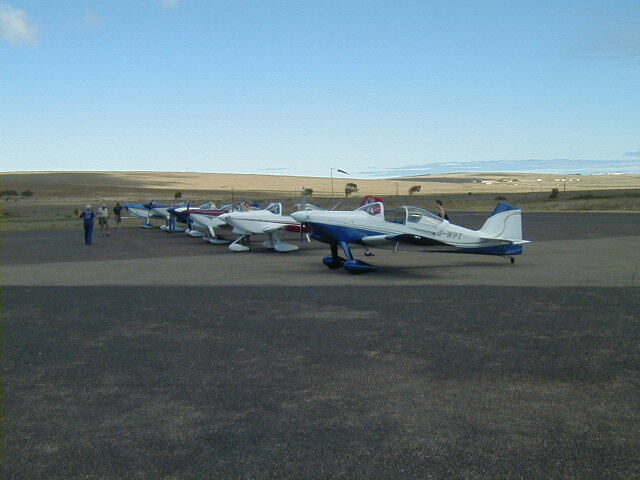 The Western Cape fly-in started at Stellenbosch on Thursday 16th of March where the weather offered a rather challenging start to the great weekend. 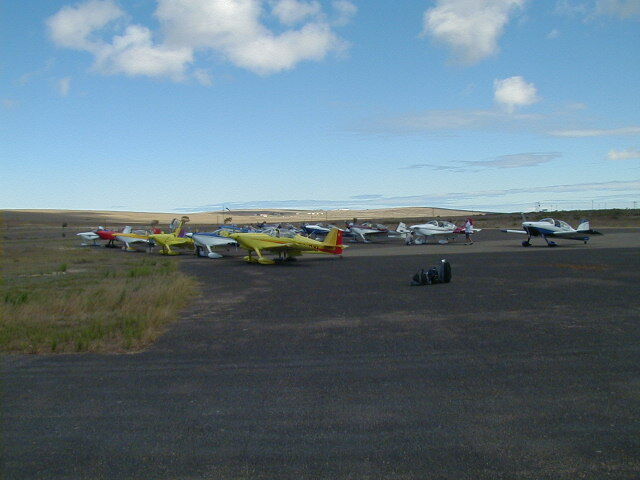 The coastal route via George was closed to VFR traffic and the inland route was the only option. The four Durban RVs departed for Cape Town heading for Johannesburg. After routing via north west of Bloemfontein during inclement weather, they finally headed south! 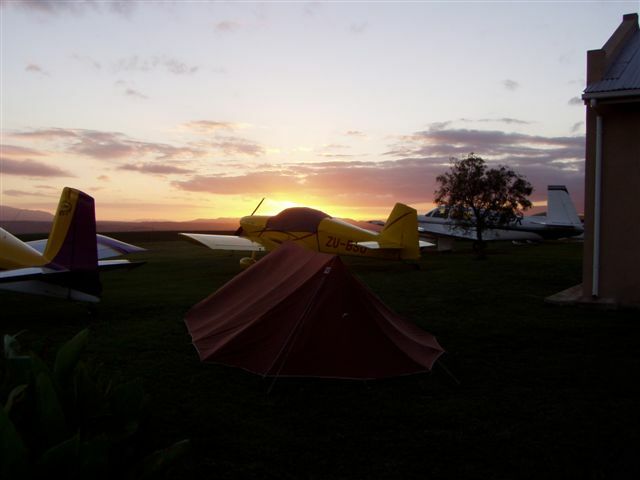 Eight hours later, some very tired looking RVators arrived at the beautiful Stellenbosch airfield. The PE based ZU-MAD enjoyed some zig-zagging through Steytlerville, Oudshoorn and on to some wettish conditions in Montague and Ashton to eventually duck into Worcester. 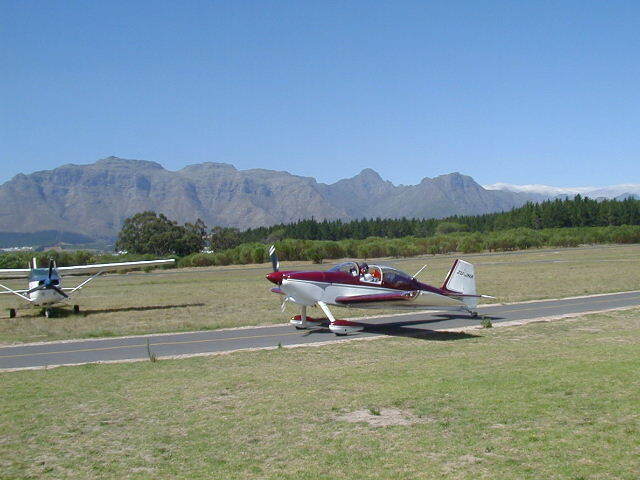 After some cool drinks and previews of the weekends aerobatics champs, they finally got to Stellenbosch via Du Toits Kloof pass. The rest of the day was enjoyed looking at various RV projects underway in Stellenbosch. 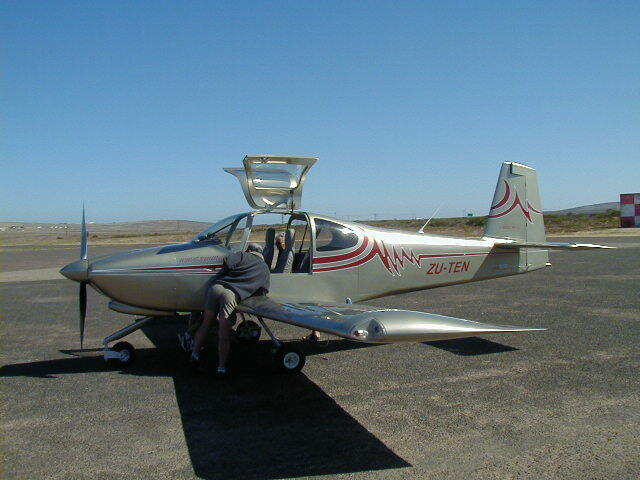 Friday morning started with a visit to Coss Aviation factory and on to the first SA RV10 at Cape Town International. After much oohing and aahing we reluctantly left to go and play with the RVs at Stellenbosch. By lunchtime, the remaining PE based RVs had arrived as well as from Kokstad. Two pods of RVs left for Saldanha, one direct and the other enjoyed a trip around the Peninsula. Fourteen RVs arrived at Saldanha and enjoyed some drinks at the Mykonos Marina followed a lovely meal at Pearly's. Saturday started with all meeting for breakfast at the Marina and planning the rest of the day. All the RV decided to head up to Lamberts Bay to sample some crayfish at the festival and had an amazing flight back down in the afternoon. Some RVs unfortunately still grounded in Johannesburg due to weather but luckily Andrew Hurst managed to scud run down to Saldanha by four in the afternoon. An evening braai was enjoyed by all at Trevor and Sandy's house. We were welcomed by our oldest member Dennis Cronje (building his second aeroplane) who was most certainly the best dressed there in his jacket and tie! On Sunday morning, some RVs enjoyed a trip to Worcester to watch aerobatics while the rest enjoyed a relaxing day in Stellenbosch. 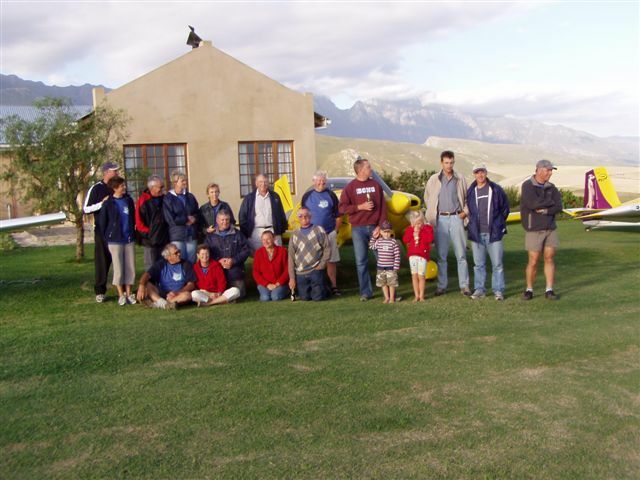 A super braai was enjoyed at Stellenbosch Flying Club that evening with all the RVators, Robin Coss and family and other builders joining in. An amazing sight was to see 15 RVs parked for the night! Monday morning saw 11 RVs enjoying the western Cape coastline en route to Happy Valley, Greyton. The venue is magnificent where the RVs parked on the front lawn of the farmhouse with a fantastic view into the mountains! Our hosts Neville and Marianne were astounding and catered for the rather large group of visitors in absolute style. Neville's Mooney did look a little forlorn amongst all the RVs! A big thank you goes to Andrew Coleman who showed us some superb aerobatics in his RV8. Now we know what they can actually do! Tuesday morning saw yet another big breakfast and sad farewells. A magnificent trip home was enjoyed by all with the weather paying long this time. A huge thank you must go to Trevor and Sandy and all the western Capers for their efforts and hospitality. Many new friends were made again and we look forward to meeting again later in the year. Needless to say, plans are underway yet again for the next RV Flyin!